Aloha, It Is Time to Have a Luau Party! Ukulele music playing in the background, guests laughing and playing luau games and enjoying delicious food and beverages from the Tiki Bar. That’s what a luau party is all about. Food and fun! These awesome Luau ideas will help you to plan and host a fabulous Luau party with ease. 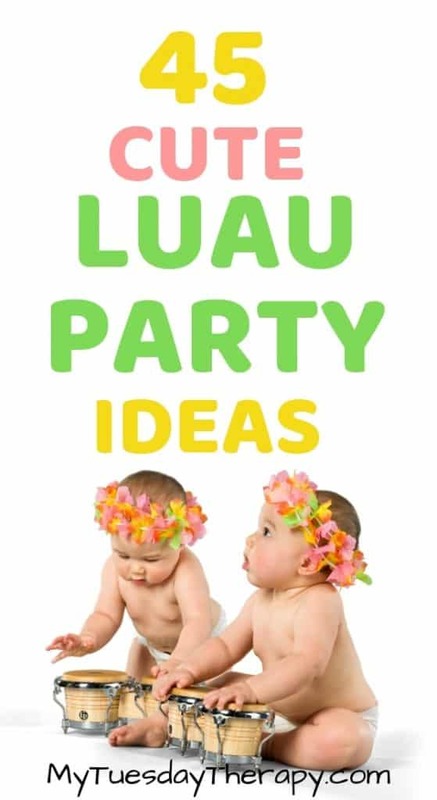 You’ll find here several luau party game and activity ideas. Simple, cheap DIY luau decorations. Cute luau outfits and yummy luau menu ideas! This post contains affiliate links which means that at no extra cost to you, I may receive a commission if you make a purchase after clicking one of my links. You’ll have a ton of fun planning and hosting a luau party whether it is a Hawaiian themed birthday party for Moana fans or a summer party for hanging out with friends. Make a fun travel poster type invitation or a pineapple shape invitation. A “plane ticket” would also be a cool invitation. There are many options available for purchase too. 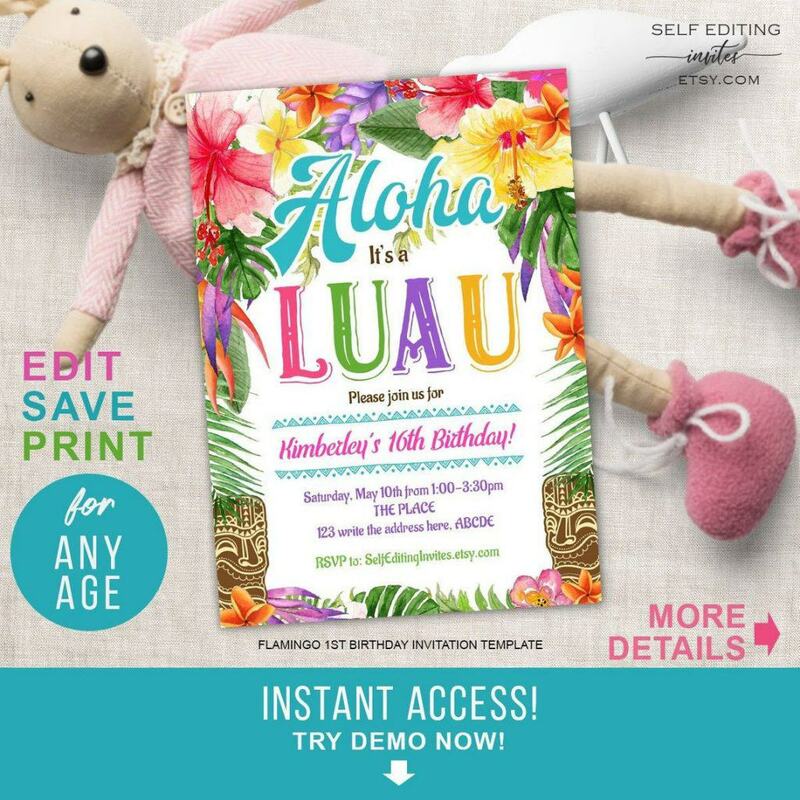 Beautiful colorful luau invitations from Self Editing Invites. Your friends will be excited to receive these invitations to a Hawaiian luau party. With simple Luau decorations you can easily create the perfect tropical atmosphere for Aloha party! Just wrap any size cardboard with a plastic tablecloth. 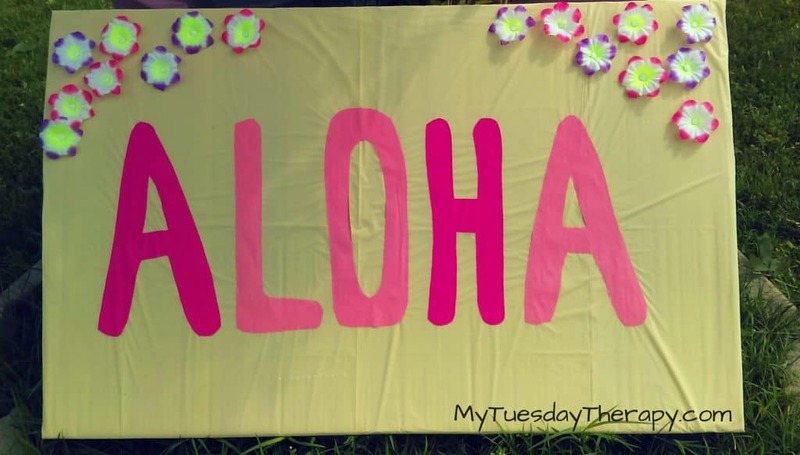 Cut up and glue your letters on and use flowers from a Lei to make it pretty. We used tacks to attach them to the cardboard. And we also had a MAHALO sign to say thank you. 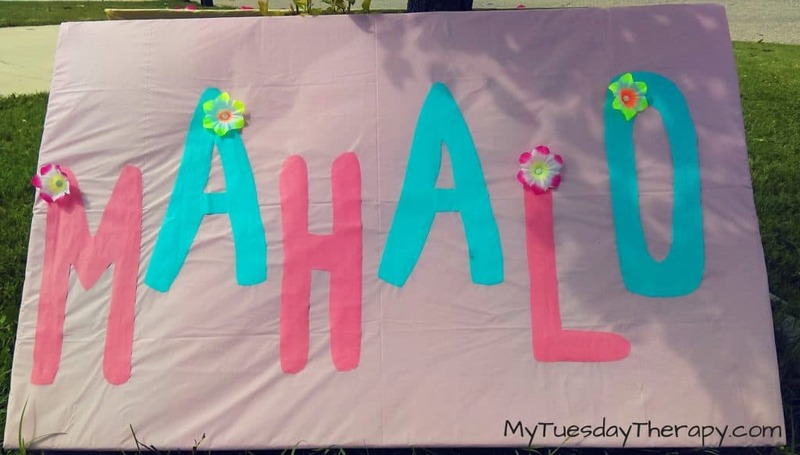 It’s another easy diy luau decoration. And one more simple Luau sign made out of cardboard. You can attach the signs to bonfire forks and stick to the ground. Really easy! 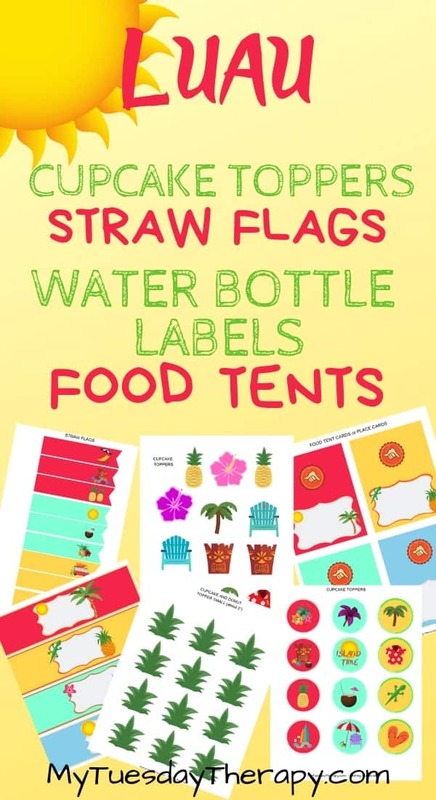 This collection of luau party printables is pretty cool, if I may say so. 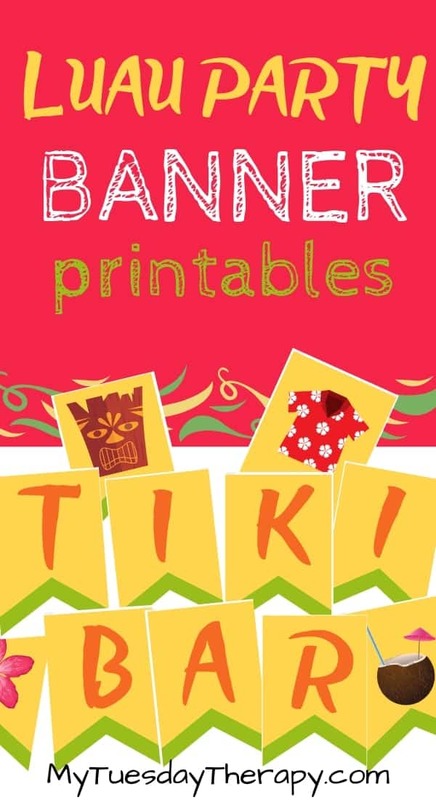 You get luau party signs, luau banner flags, photo booth props, centerpieces, cupcake toppers, favor tags etc. You’ll host a luau with ease! Hawaii has incredible beaches and what a better way to spend time there than surfing. Bring Hawaii look to your party with surf boards. 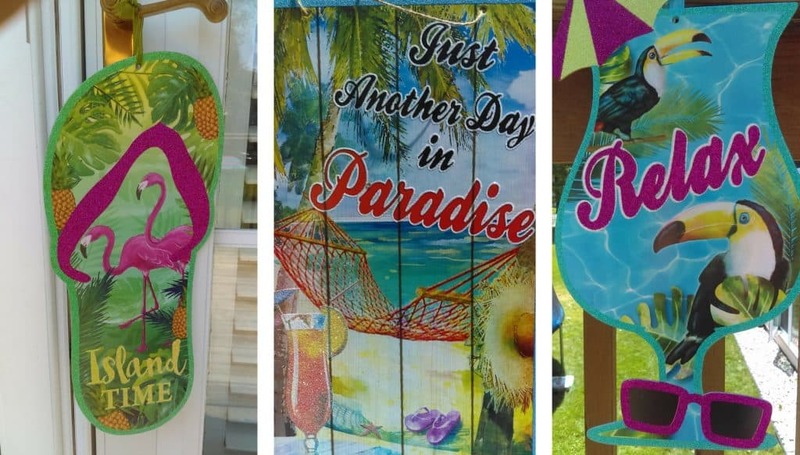 Buy a gorgeous wooden surf board sign from Frans Country FL and have it personalized to match your luau themed party. You can make great finds at Dollar Tree in the beginning of the summer. You’ll find there many fun signs, inexpensive leis, and serving dishes. Adorn a doorway or a wall with a beautiful Waterfall Ribbon Backdrop from More Than A Moment. Ribbon backdrop works also well as Hawaiian birthday party decoration. Gather the guests together with the birthday star and take pictures in front of it. Though our party was mainly outside, we made a waterfall to cover the entrance to a hallway. I wish I had a picture of it! (I know I took one but must have deleted accidentally!) 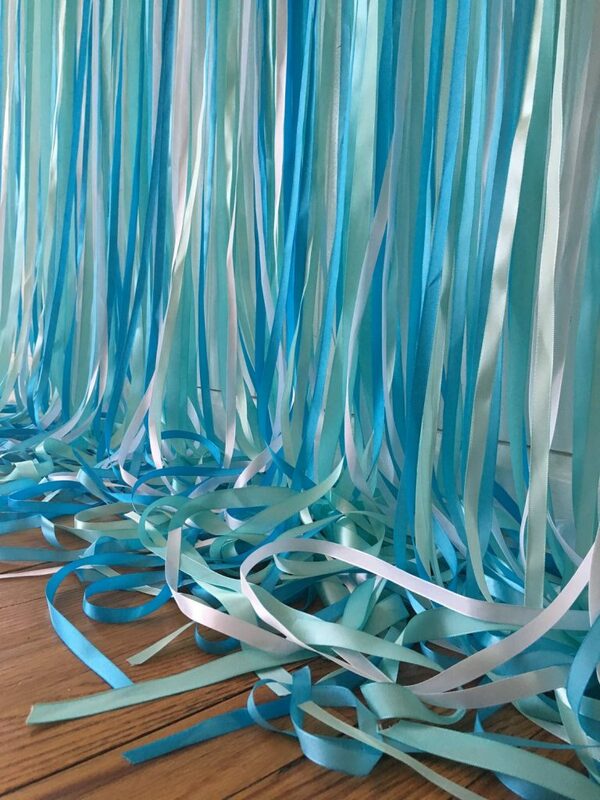 Making a waterfall is really easy: hang blue fabric strips in layers from the ceiling maybe with some sparkly tulle to give it a little fluff. Or use plastic tablecloths like these tropical blue ones. This gorgeous beach scene from Huayi Photo will make your party area to look even more Hawaiian. Use it as a photo booth backdrop or as a beautiful scene behind the dessert table. You could also use it to create a fun background for a seating area. Put a couple of beach chairs in front of it for the guests to sit and relax while gazing into the horizon. Buy a few Luau themed cups from Amazon. Put some rocks in to keep the wind from blowing them away and place a battery-powered candle in each. An easy Luau centerpiece idea. A Hawaiian Luau party would not be a luau without the grass table skirts! It is an easy and cheap way to decorate the tables. Hawaii is a colorful place. I had the privilege to live there for three years. Lovely flowers everywhere. 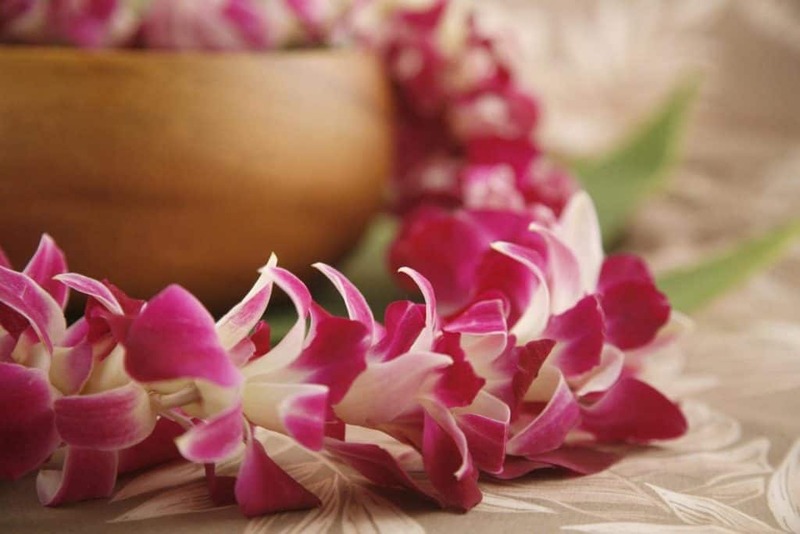 Hang a few beautiful flower garlands to bring in the aloha. Favor Box Boutique brings you a delightful hibiscus lantern garland. 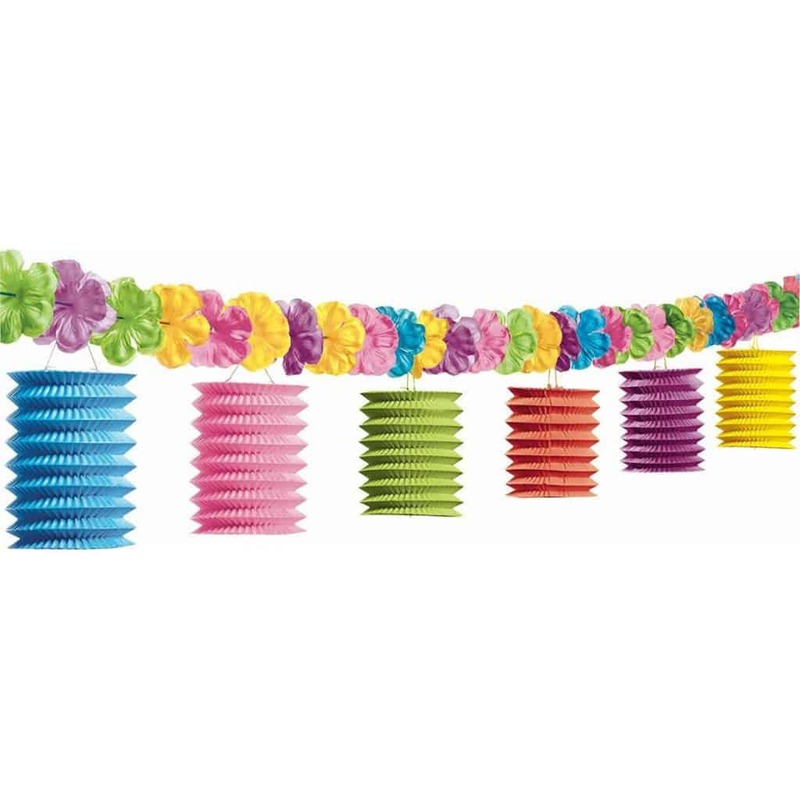 The perfect garland to hang over the food table. The yellow hibiscus is the state flower. Cut out flower shapes from bright colored card stock and put those on walls and doors. Hawaii and pineapples go together. Create Luau centerpieces around real pineapples or use honeycomb pineapples you can get in many stores. Add a few coconuts, mangoes and palm leaves to complete the Hawaiian look. Palm trees say “vacation” to me. A 7 ft palm tree next to your Tiki Bar or dessert table gives the Luau party just what it needs. Get one from Amazon and wow your guests. Use palm leaves as placemats or make a table runner with them. Hang them on the wall or use them to decorate your Tiki Bar. Buy the inexpensive fabric palm leaves from Memorable Party Favors and get creative with them. Pineapple and coconut shaped cups add a nice touch to your aloha party. 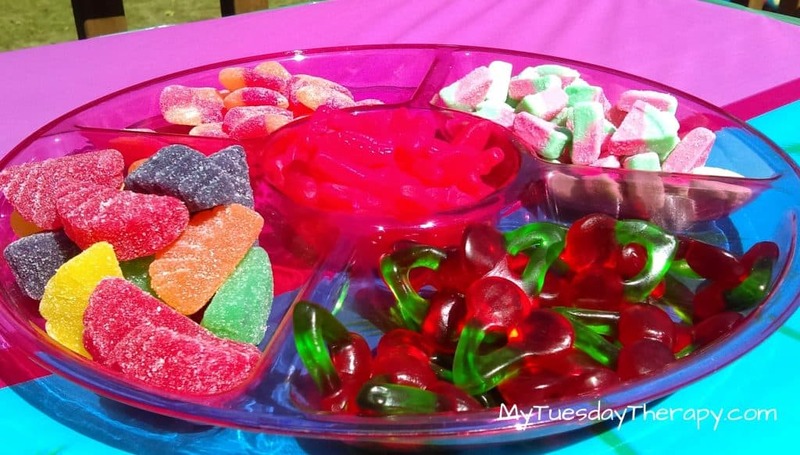 Use them for serving bevarages or snacks such as fruit and candy. 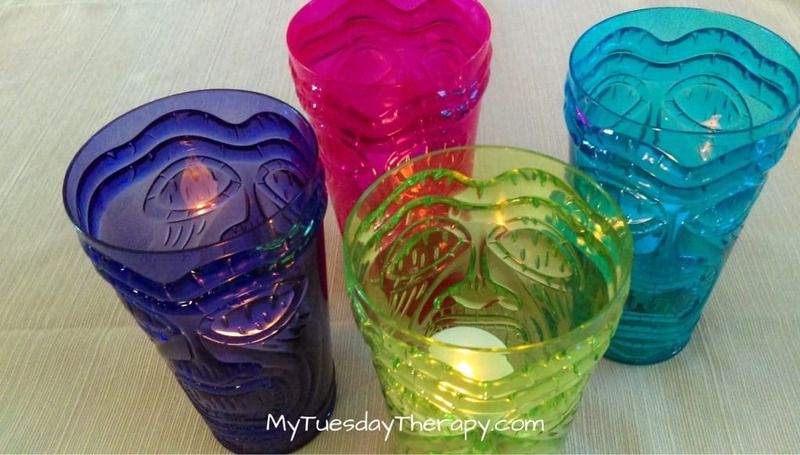 Tiki Bar – a Luau Party must have. 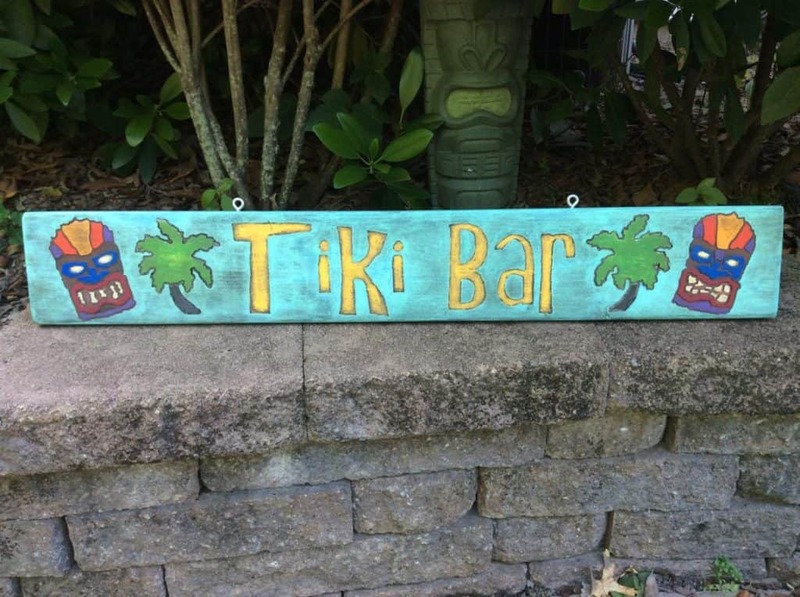 Whether you serve cocktails or mocktails this Tiki Bar sign from Whittle Imagination turns any table into a Tiki Bar. Wrap a grass table skirt around the table. Add a few props and you are ready to go. I loved how in Honolulu I always saw lights wrapped around trees. Looks really pretty. You can do that same thing at your place if you have trees. If you don’t then hang them from your deck or anchor poles to the ground for holding the lights up. Light up a few torches too. Hawaiian Honu, Green Sea Turtle is a symbol of wisdom and good luck. Create a turtle cove in your luau party area: A kiddie pool with little bit of water and inflatable turtles (Amazon ) floating around. An aloha fun set of centerpieces that work well also as photo props. 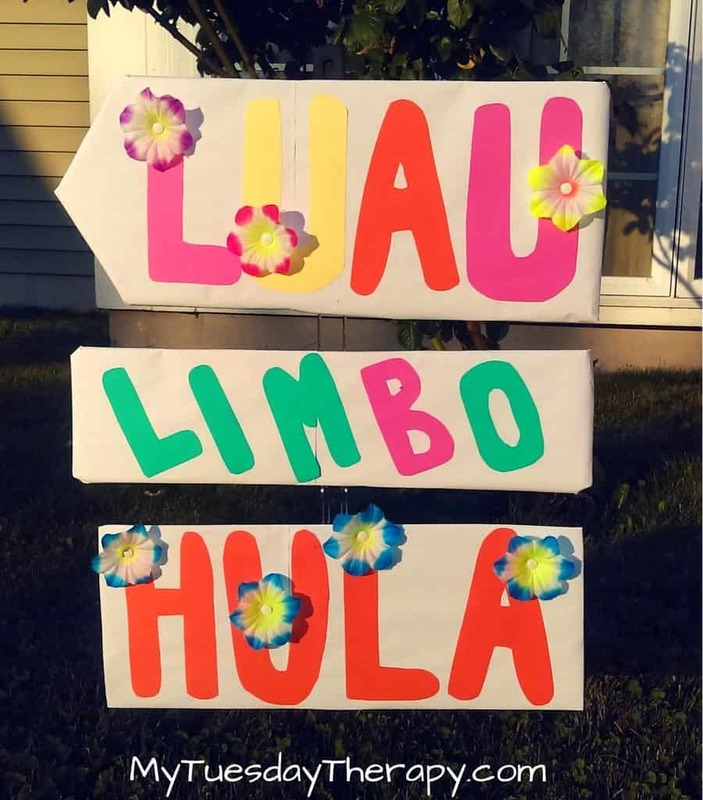 Simple luau decorations for you fantastic luau party! Check out the centerpiece printables! What to wear to a Luau party. Nothing like a real flower lei. You’ll love the soft touch and fragrant scent. Get this Orchid Lei from Aloha Island Lei. Many options to choose from. Seashell lei is a fun alternative to a flower lei. You could have leis set up for the guests to pick one when they enter the luau party. A beautiful plumeria flower hair clip from Lava Works HI will add a nice touch to your luau outfit. Traditionally, you’d wear it behind your left ear if you are married or in a relationship and behind the right ear to signal that you are single. Many tropical color and pattern choices for this versatile garment. Just click here or on one of the images above for other sarong designs. Get creative with your sarong and wear it in a way that suits your taste. Your little one will love to dance hula in this beautiful Hawaiian dress for girls. A fun luau outfit for her. More styles for women and girls at Hot Lava Clothing. They also carry cool Hawaiian shirts for guys. Amazon has many inexpensive Hawaiian dresses for women and girls in various colors and styles. The most common shoes I saw in Hawaii were flip flops. So if you have a pair of those you are ready to go. The official state color is yellow so anything yellow would be cool. Sun hat and sun glasses with any summer dress or shorts say “aloha”. As mentioned before with leis and hair clips you can turn any outfit to be the perfect outfit for luau party. 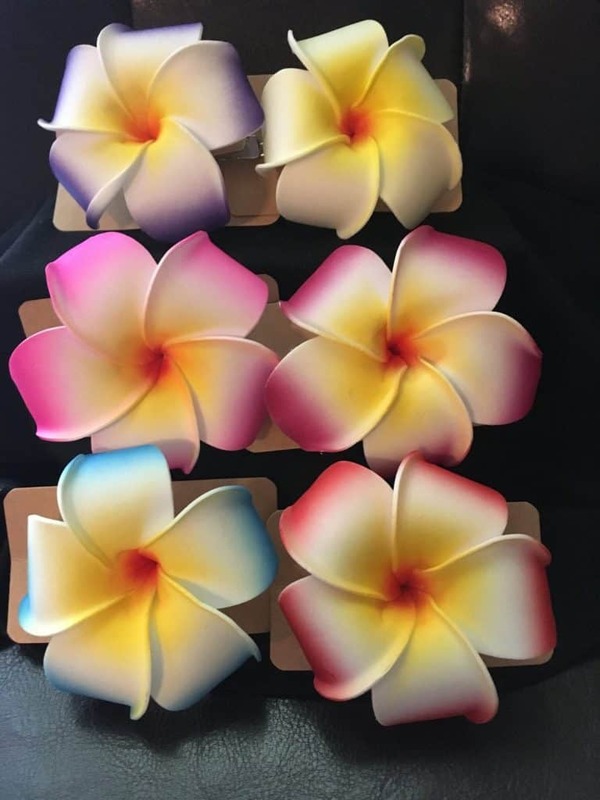 Go through your closet and see if you have clothes to match one of these plumeria hair clips from Lava Works HI. For example: pink top and white shorts; blue shorts with white and yellow striped shirt. These easy luau games will delight kids, teens, and adults. The kids really loved this game. Will be doing it again at our next Luau! A carry on suitcase for each team. in each suitcase: a pair of sunglasses, beach towel, sunhat, lei, grass skirt etc. One member of each team at a time pulls the suitcase to the “Beach”. Lays down the towel, puts on the sunglasses, sunhat, lei etc. and lies down on the towel. Quickly gets up and packs everything back in the suitcase. Runs back home and gives the suitcase to the next person. 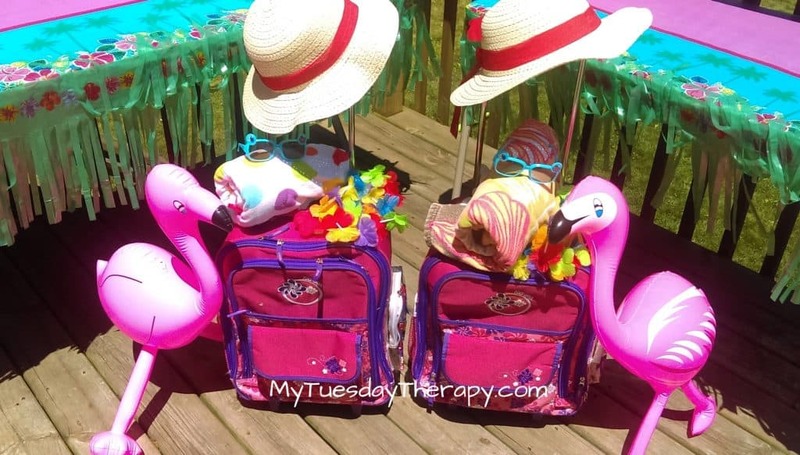 We had two inflatable flamingos that did not fit inside the suitcases so the “tourists” carried them. The kids, from preschoolers to teens had fun with this Luau game! Limbo is a fun activity that works as a luau game for adults, teens, or kids. All you need is a limbo stick and a couple of poles or people to hold it. We didn’t have a limbo stick so we used a pool noodle. The problem with that is that somebody needs to hold it and the measurement is not always accurate. This limbo game from Amazon gets good reviews and is said to work for teens too. Items you need: pool noodle for each player. Beach Ball. Cones or soccer goal. The pool noodles from dollar store were little too flimsy. They might work for small kids if you make the pool noodles shorter. I have not tried these pool noodles from Amazon but per reviews they are sturdier. They come in 9 different colors so you can pick the two you like the best for your pool noodle hockey teams. Entertain also your pool party guests with Pool Noodle Hockey. Hula is a beautiful Hawaiian dance. If you don’t already know hula, learn a few basic moves and teach them to your guests. Purchase Luau items from dollar store or Party City to give as prizes. You could also give pineapples, coconuts, towels, buckets, sun screen and so on. You’ll need pineapples for the pins and a coconut for the ball. 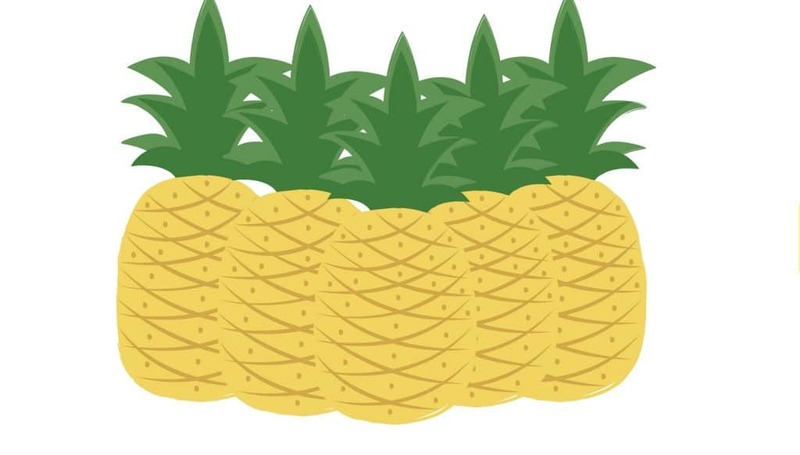 If you don’t want to be knocking over real pineapples you could make pineapple pins with water or soda bottles and cardboard or card stock. Cut out pineapple shapes and attach to plastic bottles and you are all set for bowling. Who can spin the hula hoop the longest. Make a hula hoop obstacle course and see who can go through it the fastest. Hula hoop ring toss... if you have a big enough target. Hula hoop flip-flop kick. Stand up a few hoops or tie a couple from a tree branch and try to kick your flip-flop off your foot and through the hoop. Have also a white board or paper and pens ready for the amazing drawings. Hide luau-themed items in the party area. Give the kids a list of the items they need to find. Well, sometimes a little bit of quiet work is needed. Set up a place for kids to read books and color. 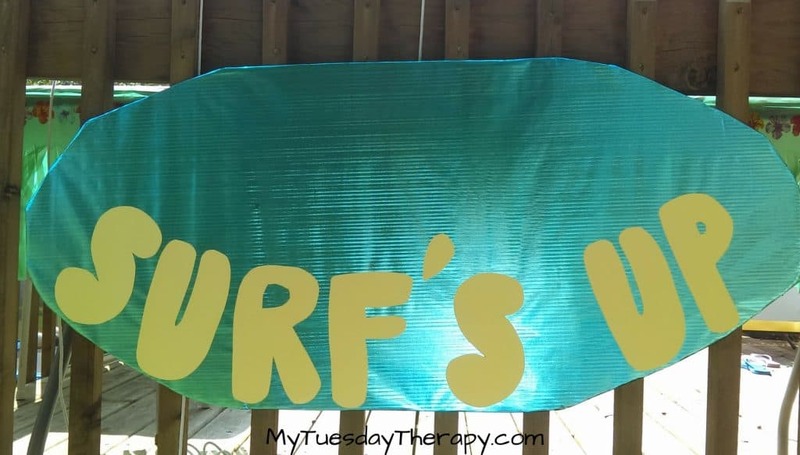 DIY surf board decoration. These cute party favor size surf boards from Sea Gypsys are perfect for a craft time. The kids can paint them and write their name or Aloha on them. Decorate a cool tiki mask from The Wood Shape Store. You can get them in various sizes and a couple of different styles. Maybe some of the adults would like to paint a tiki mask too and take it home to remind them of the fun Hawaiian luau party! With beads and beach themed charms the kids and teens can make cute ankle bracelets. You find the inexpensive bracelet kit at Amazon. Use a horse shoe set but instead of horse shoes toss leis. You could also use pineapples as the target! You need teams of two people. Ask the team members to stand a few feet away from each other. One of them throws and the other one catches. The goal is to toss the leis around the catcher’s neck. The catcher can move to make it easier but can’t use hands. Here are luau food ideas that will please the crowd! Serve them from pineapple shaped plates and handmade coconut bowls. Label the food with luau themed food tents. A must have food in any luau is pineapple! It tastes good with chicken. Your guests will enjoy any kind pineapple chicken dish. Grill chicken and pineapple slices and serve with other grilled vegetables. Just add a couple of yummy sides and desserts and you have the whole luau menu covered. 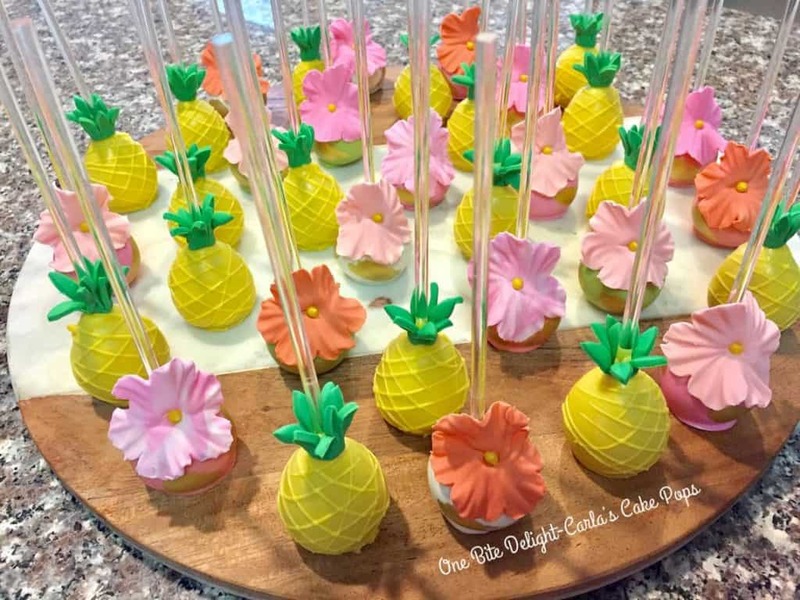 Irresistible Hawaiian themed Cake Pops from Carla’s Cake Pops. Impress your guests with tropical flower and pineapple cake pops that look almost too good to be eaten. Perfect bite size treat! Luau food just got easy! These cupcake / food toppers make any food to be luau themed food!! The water bottle labels can be used for soda bottles, juice boxes, and of course water bottles. 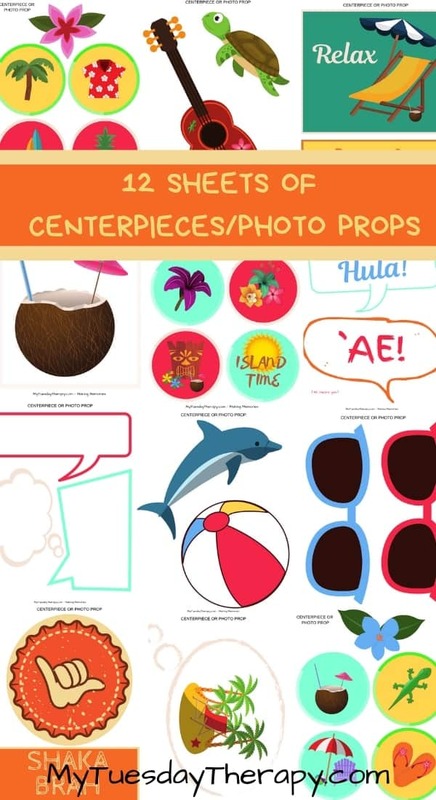 You’ll love this set of fun luau printables!! The pineapple toppers look awesome on donuts too! 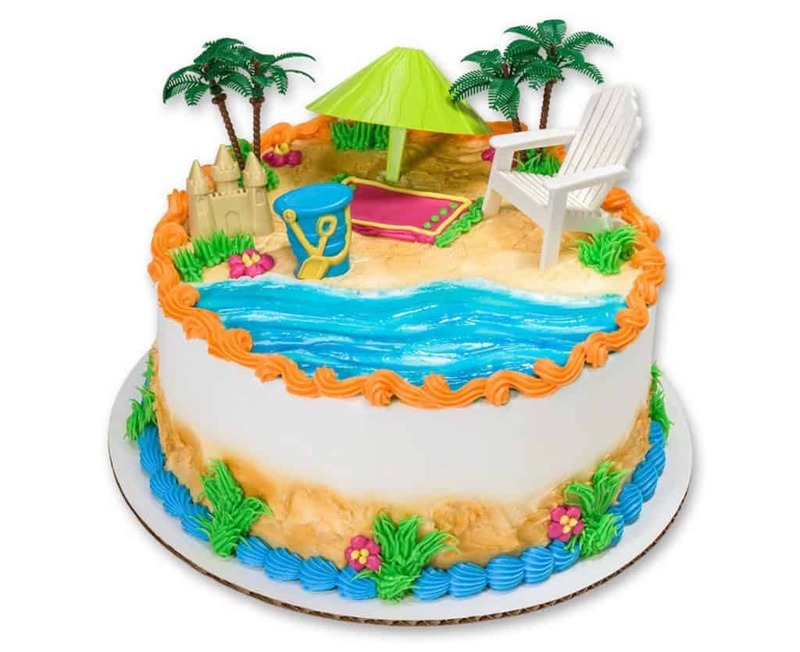 Tropical cake topper from Cake World USA brings the beach to your luau party. Palm trees, beach chair and beach umbrella! What else do you need for a fun relaxing day at a tropical beach. Though the cake is not included, you can use the cake toppers to turn your cake into a beach themed cake! 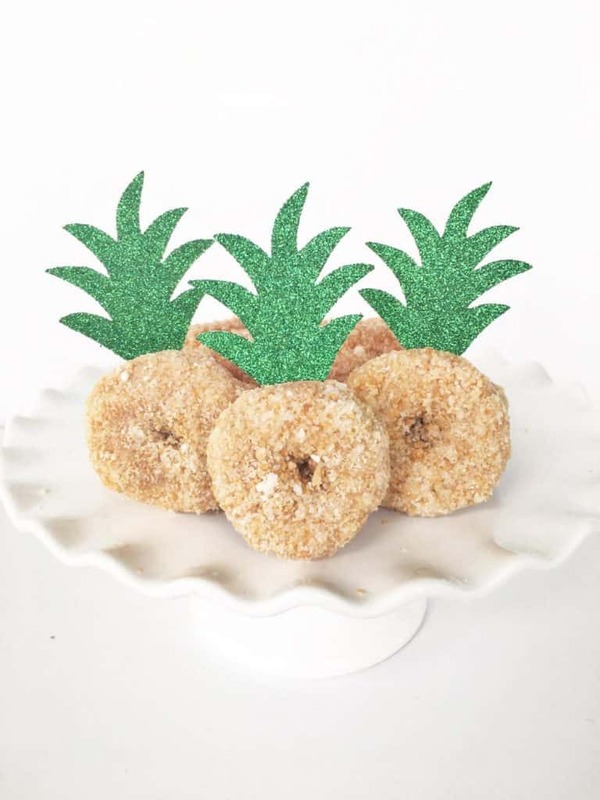 I don’t know about you but I like easy dessert ideas and this pineapple donut topper from Glitter Party Co fits that category. Push the donut topper to a mini-donut and you are done! Yes! Loving the idea. Donut toppers in two sizes. Chop up mangoes, pineapple, honeydew, and cantaloupe. Arrange in clear cups adorned with tropical flowers you have cut out from card stock. Sprinkle the fruit with shredded coconut. Put a colorful cocktail fork in the cup. Or one of the cool luau food toppers. Make various fruit combos, some with berries too. Pineapple fluff is delicious and easy to make. Mix together crushed pineapple and pudding mix. Gently fold in the marshmallows, cool whip, and nuts and coconut. Chill for a couple of hours. Prepare the pudding mix according to instructions using 1 to 2 cups of milk. 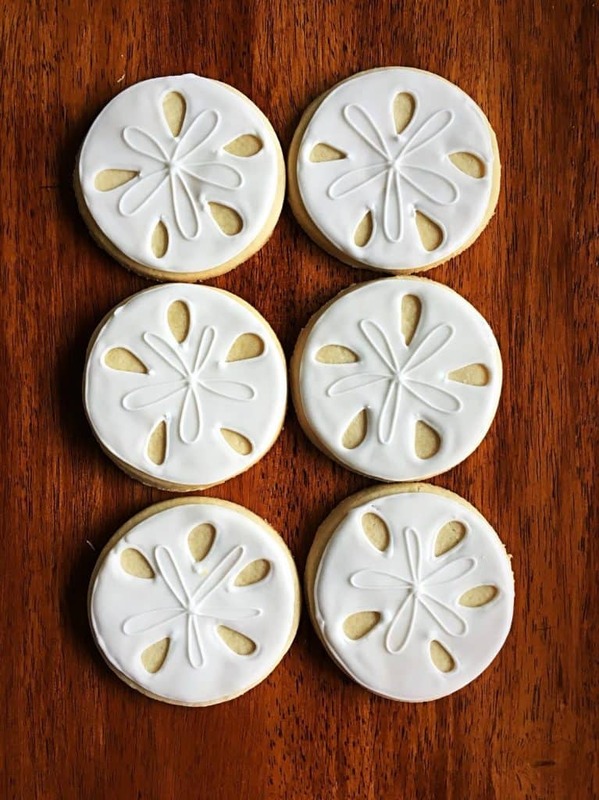 Sand dollar cookies from Meg Z Cookies are a delicious treat to be served at a luau party. Order yours or make your own. Make also beach ball cookies! Decorate round sugar cookies with simple royal icing and serve on a Kona wood plate. You could also individually wrap these and hand out as luau party favors. Parfaits are easy to make, they look good, and taste great. Prepare the pudding with 1 1/4 cup of milk. Stir in cool whip. Layer 1/2 of the cake cubes, pudding and pineapples. Repeat layers. Add whipped cream and coconut. Makes one big parfait or 6 1-cup servings. Got to have shave ice at a Hawaiian luau party. Shave ice is different from snow cones, I’ve been told. Snow cones have larger granules. 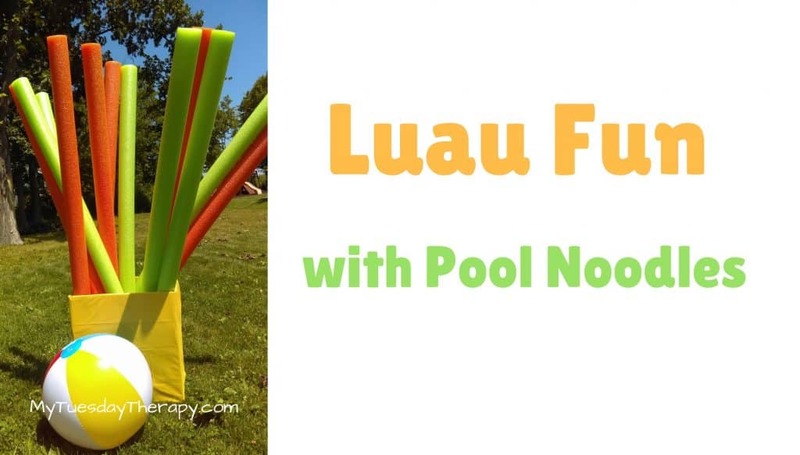 You can easily make this kid approved luau party food with shave ice maker. 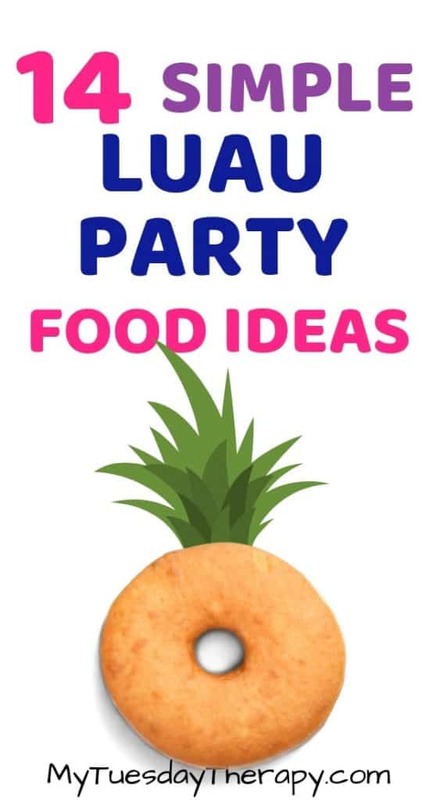 I really like easy luau food ideas and coconut cupcakes fit that category. Make the cupcakes your usual way but add 2 tsp coconut extract to the batter. Decorate the cupcakes with basic buttercream frosting and top with shredded coconut (maybe toasted coconut). And as a final touch add a cocktail umbrella or a cocktail palm tree! This banner flag set comes with letters from A to Z, numbers from 0 to 9 (also st, nd, rd, th), and images to make it totally awesome! What will you display at your Luau. 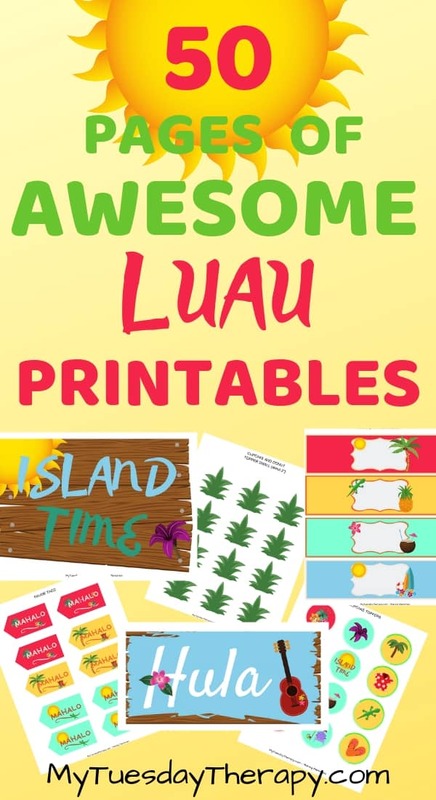 Check out the fun luau printables. Over 50 pages of fun stuff to make your Luau party dance hula. 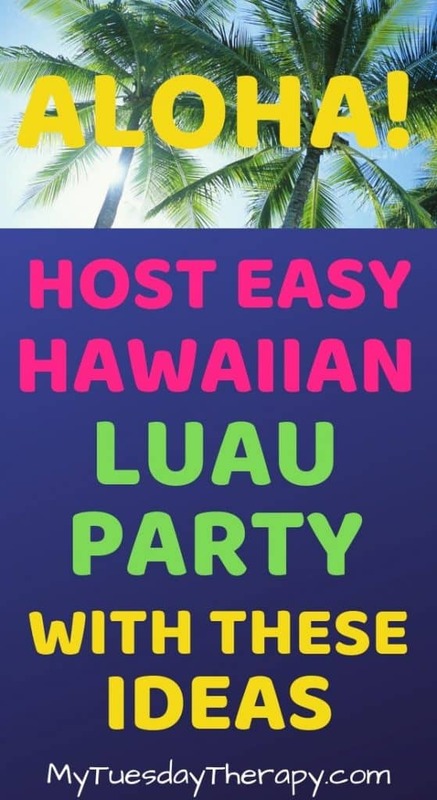 Have a wonderful time planning and hosting your Luau!